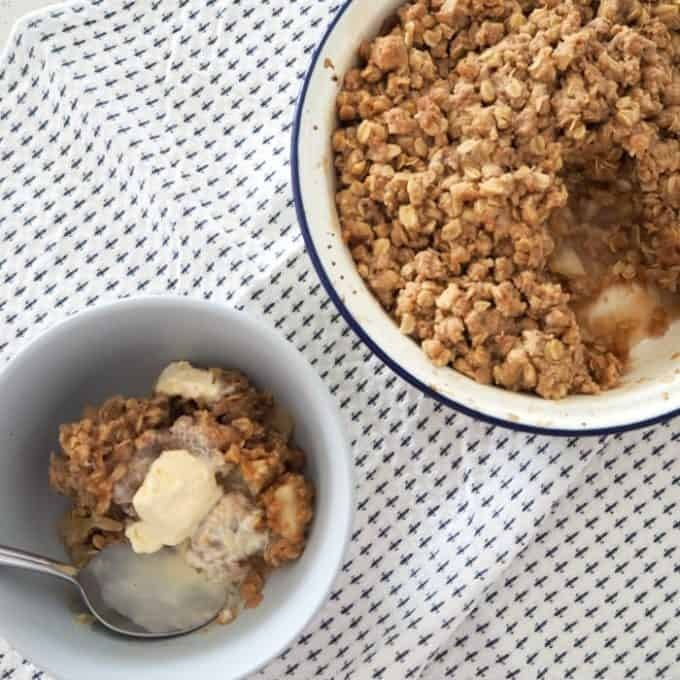 This easy Apple Crumble recipe is sure to become one of your new family favourites! Thermomix instructions are also included. When I’m out and I see Apple Crumble on the dessert menu, I will ALWAYS order it. It’s one of my all time favourite desserts (especially when served with vanilla ice-cream which has started to melt through) and even better is is SUPER easy to make yourself at home. This is one of those easy dessert recipes that you can put together in no time at all and then pop into the oven to bake while you enjoy your meal. It’s also a pretty forgiving recipe and if you’ve got a few extra (or less) apples than specified, you can easily just use what you have. While I could eat this Apple Crumble all year round, now that the cooler weather is here (or is at least meant to be!) it’s the perfect excuse to start making this yummy dessert again more regularly – enjoy! 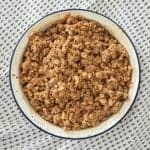 This easy Apple Crumble recipe is simple to prepare and will quickly become one of your family favourites. Pre-heat your oven to 180 degrees and place a large pie dish or baking dish onto your bench. Place the apple pieces into your pie dish and add the lemon juice, 1/2 cup of caster sugar and 1/2 teaspoon of cinnamon and mix until the apple is coated with all of the ingredients. In a large bowl, add the melted butter, plain flour, rolled oats, 1/2 cup of caster sugar and 1 teaspoon of cinnamon and mix well to combine. 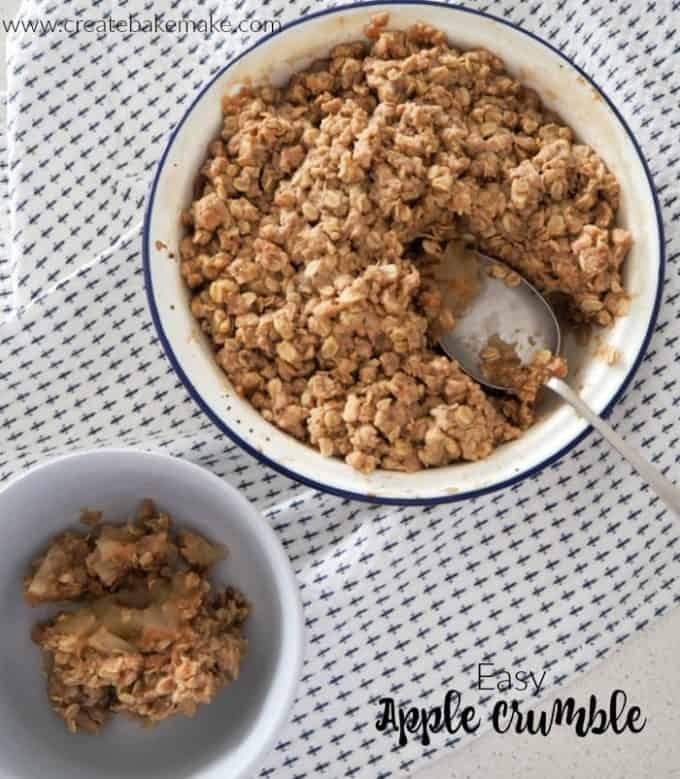 Using your hands, sprinkle the crumble mixture over the top of the apple pieces. 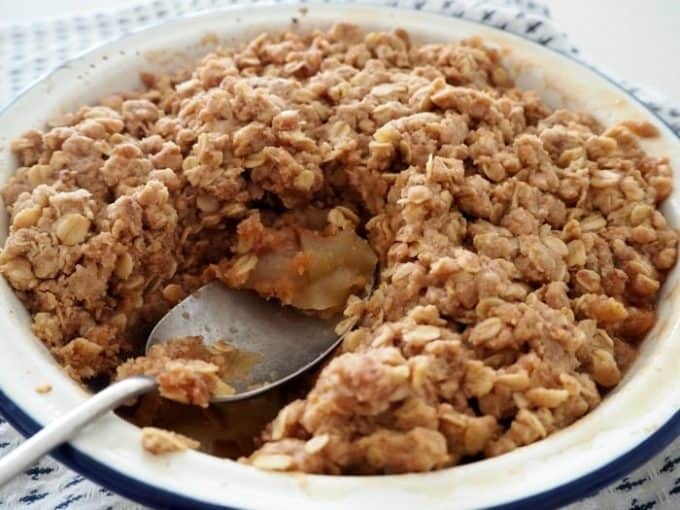 Place the Apple Crumble into your preheated oven and cook for 40 minutes or until golden on top and the apple has cooked through when tested with a knife. Carefully remove the Apple Crumble from the oven and allow it to cool for 5 minutes before serving. In your Thermomix bowl, add the butter (cut into cubes) and cook for 3 minutes, 60 degrees, speed 2 to melt. Add the plain flour, rolled oats, caster sugar and cinnamon and mix for 5 seconds speed 4 to combine. Scrape down the sides of the bowl and mix for a further 3 seconds, speed 4 – REVERSE. 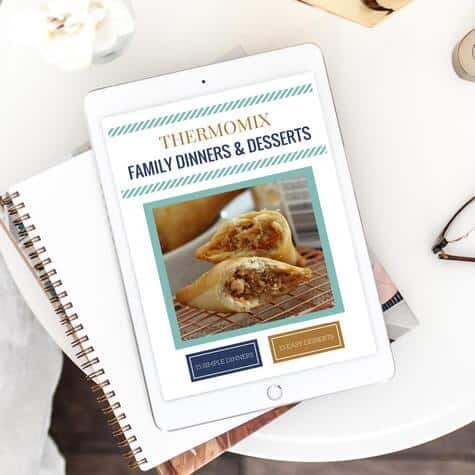 For more easy family recipes, check out our Thermomix Family Dinners and Dessert eBook. You can shop the full range of print and eBooks here.